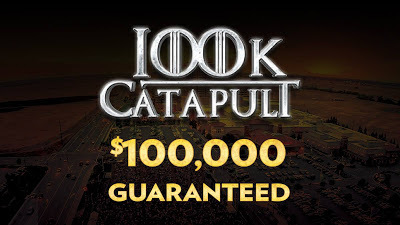 One final flight to play in the $100k GTD Catapult - the prize pool already in excess of $150k - and registration is open at the front counter for that final 5pm-starting-time flight. Begin with 12,000 chips, play 20-minute levels during the 6 levels registration is open, play 30-minute levels once registration closes at the start of Level 7 (~715pm) and the final 8 percent of the field moves on to Sunday's 1pm start Day 2. 93 have already qualified for Sunday's Day 2 that plays all the way down to a winner.